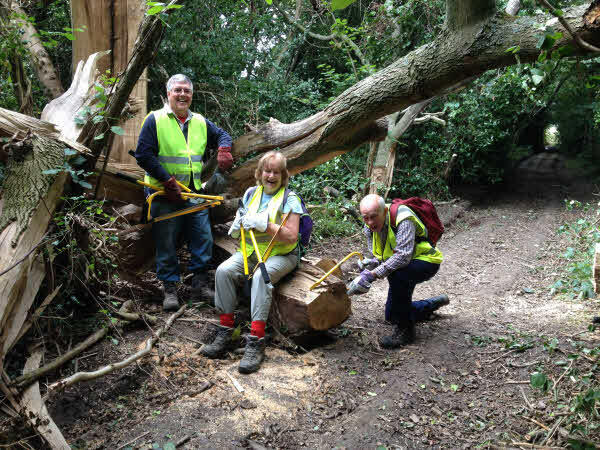 Reduced funding for vegetation clearance, carried out by contractors, was the first of a series of savage cuts to the Kent County Council Public Rights of Way budget, to be felt by the walking public. The remaining funds in the KCC coffers had to be accounted for and spent wisely on paths that regularly attract the feet of many visitors. Priority was given to those that were on a route to the local school and other public attractions. Paths that didn't have that luxury were sidelined. There was no other choice when the highways department was struggling to fill in potholes and maintain roads and country lanes used by motor vehicles. The highways department had overspent its budget. The highways department funds the public rights of way department. The future looked gloomy. 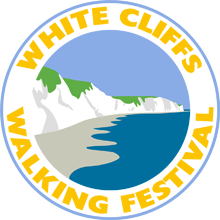 White Cliffs and Maidstone group did a trial run. We were the first to dip our toes in the water and our success inspired other groups to follow our lead. There are currently nine Rambler groups across Kent with a vegetation clearance team. In 2016, we cleared a combined 20 miles of blackthorn, nettles, brambles, gorse and tall grass to make a difference for every walker. It would take the entire British army to keep every footpath in good order, but we are doing our fair share and we are making a noticeable difference. It has to be one of the most rewarding things to do. You arrive at a wilderness with a few cheery volunteers and a couple of satisfying hours later, you leave behind an inviting footpath and a sign to tell the world who carried out the work. It's quite likely that there will be a cup of coffee and some cake or biscuits to be had as well. Some of us have gone home with the added bonus of fat juicy blackberries, sloes and mushrooms. 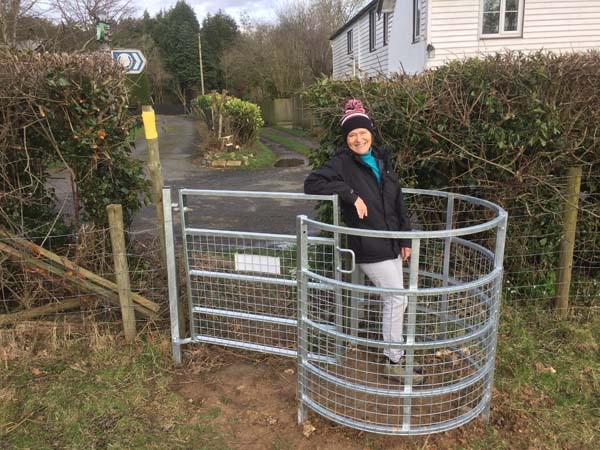 Feb 2017 - John Polden's team have installed 4 new kissing gates. 2 have gone in at Little Foxholt and 2 at Pound Farm in Densole. Thanks as always to John's team for installing them and to local farmer Roger Bayly and KCC for funding the substantial cost and delivery of the gates. On regular Tuesday mornings, when the weather is up for it, John Polden's working party meet up. KCC will have been in contact the night before to tell John where they are going and details of the work. Stiles are rarely fitted these days with a move towards longer lasting, easier to maintain gates and stiles. The team fit gates, kissing gates, steps, barriers, handrails, small bridges or wooden waymarker posts. 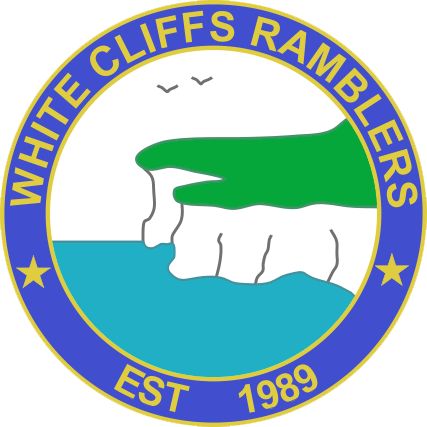 You can usually see where they have been because they always attach a plate telling the walking public that White Cliffs volunteers have been in action. 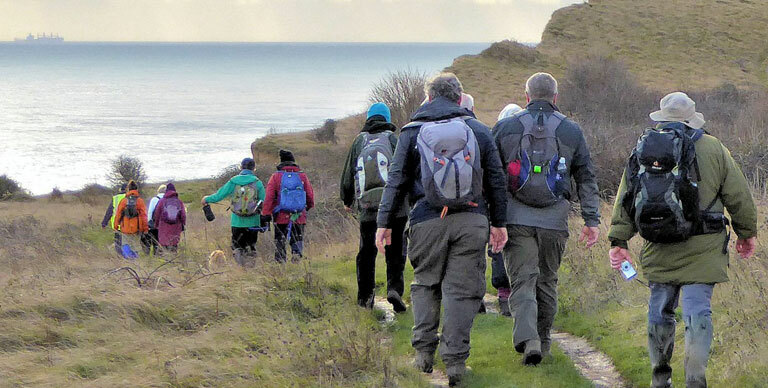 They rarely claim the cost of their travel, but when they do, it is Kent Area Ramblers that pay for it. Steve Brice says that he always looks forwards to Tuesdays and meeting up with the boys. The coffee and cake afterwards is a real incentive. John's current team is Steve Brice, Kelvin Castle, Keith Playforth and Jerry Swallow. Past members have included Dave Munday, Rob Riddle and Ted Roche. The first working parties were set up in 1997 by Brian Godden, Ted Roche, Dave Munday, Peter Carr and Richard Barton, covering Dover and Deal. A second team with Richard Blackford, Andrew Boultbee, Roy Crane and David Jones covered Shepway, but has since disbanded. John Polden has been involved since 2004 and his team has installed at least 220 kissing gates during that time.